Your backyard should be a paradise, a place for you to relax with your friends and family. There are many great features that you can add to your yard to make it your own, whether you desire something social or serene. Here are a couple of examples to beautify your backyard landscape! Outdoor fireplaces are wonderful not only for warmth in unseasonably cool weather, but also create a romantic ambiance that adds warmth and comfort to your outdoor living space. Outdoor fireplaces come in a variety of sizes and styles, and are great for people who are looking to create the perfect social hotspot in their own backyard. One of the most important things to remember about owning an outdoor fireplace is that it does require general maintenance and cleaning. Depending on the size of the fireplace, basic cleaning can be accomplished with an industrial vacuum cleaner, but larger fireplaces should be installed, cleaned, and maintained by an expert. When using an outdoor fireplace, be sure to invest in a good safety screen. Not only does this protect from objects falling into the fire, but it can also help prevent ashes and burning embers from escaping the fire and blowing around your yard, which can be very dangerous. When you are finished using the fireplace and the fire is extinguished, it is always a good idea to cover the unit with a solid, fireproof covering to prevent the fire from reigniting. If you plan to clean the fireplace yourself, invest in a good industrial all-purpose vacuum cleaner, and always make sure that the ashes in the unit are completely cool. Wait at least 24 hours after the last fire before considering vacuuming the ashes. 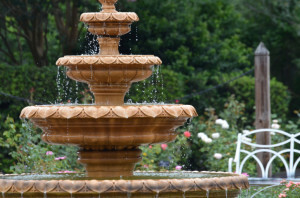 An outdoor fountain adds beauty, peace, and serenity to your property. No matter the size of your fountain, it is a beautiful feature that can help increase your home’s value if properly cared for. If you are interested in installing a fountain on your property, but are not sure that you can care for it, keep in mind that most fountains are rather straightforward as long as they receive regular cleanings. One of the most important things to consider when installing a fountain on your property is location. Areas that experience a high amount of sunlight should be considered only if the homeowner can ensure a strict cleaning schedule. Algae and other types of bacteria thrive in well-lit areas, and can become a challenge to remove if a proper cleaning schedule is not developed. Cleaning varies from fountain to fountain, but it usually involves regularly emptying the fountain and pumps fully, and scrubbing the internal walls to prevent the build-up of dirt and lime scale. A full top to bottom fountain cleaning should occur at least once every 1-3 months, depending on the size of your fountain. During the winter months, small fountains should be moved to a sheltered area. If this is not possible, invest in a protective fountain cover to help shield the structure from the elements. Doing so will ensure that your fountain will be ready to use as soon as the weather warms up again! If you are interested in learning more about outdoor features and landscape design, read our blog for more inspirational ideas and helpful information. If you are thinking about creating a beautiful landscape design for your backyard or property, visit Greener Horizon online, or give us a call for more information and a free consultation!